With the exception of Blizzard World, the current Overwatch PTR is a sleepy one, with hero changes thin on the ground but for a few technical fixes for Doomfist. That changes today, with nerfs to two of the game’s overperforming heroes. For everything else in the current PTR, check out our Overwatch 1.19 patch notes. 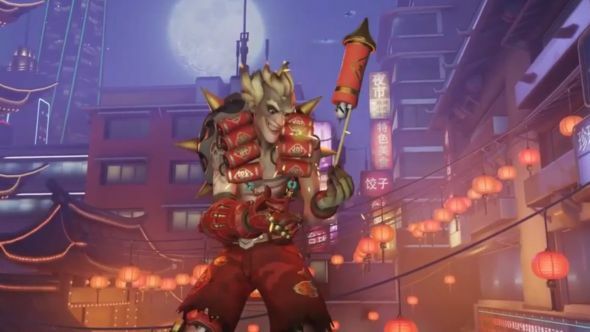 The news first: Junkrat’s Concussion Mine will now deal less damage to targets further away from the explosion’s centre, and Mercy’s Valkyrie ult is getting yet another round of nerfs. It no longer makes Resurrect instant or provides a bonus charge of it, the speed boost it provides to her Guardian Angel ability has been decreased by 50%, and its duration has been reduced from 20 seconds to 15. With this change, he can dish out similar damage, but he’ll have to be more accurate with his tosses. Wiping clustered teams should also be harder, given there is much less splash. As for Mercy – the hero who never stays in one place, in at least two senses of the phrase – her changes are aimed at mitigating the impact that her ultimate has on her Resurrect ability. Presumably the goal continues to be enabling her to resurrect, but not so often that she undoes a well-worked triple-kill by the enemy team. Goodman also acknowledges that she’s too mobile while in Valkyrie – something that has been frustrating many players. Goodman says Blizzard will iterate on these changes “in the coming weeks,” which means they probably stay on the PTR until big blue are satisfied. And yet, Blizzard World has been in testing on the current patch for a while now, and players will be keenly awaiting its release to live. Blizzard have split PTR patches before – Blizzard World still hasn’t gone live – so we’re guessing they’ll do so again, bringing Blizzard World to live in a week or so but leaving these nerfs for a little longer.